ROVER, MG, LANDROVER K SERIES ENGINE HEAD GASKET KIT, TIMING BELT KIT & WATER PUMP. 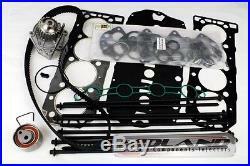 ROVER, MG, LANDROVER FREELANDER MULTI LAYER METAL HEAD GASKET SET, TIMING BELT / CAMBELT KIT & WATER PUMP. COMPLETE KIT AS SHOWN IN PICTURE. WILL FIT: 1.4 1.6 & 1.8 LTR 16 VALVE K SERIES ENGINES FROM 1995>> Onwards. UPRATED MULTI-LAYER STEEL HEAD GASKET & SHIM. INLET AND EXHAUST MANIFOLD GASKETS. TIMING BELT / CAMBLET KIT. LANDROVER FREELANDER 1.8 LTR 16 VALVE 1997>>. ROVER 214, 414, 25, 45, MGZR 1.4 LTR 16 VALVE 1995>>. ROVER 216, 416, 25, 45, MGFT, MGZS 1.6 LTR 16 VALVE 1995>>. ROVER 45, MGZS 1.8 LTR 16 VALVE 1999>>. ROVER 218, 75, MGF, MGFT 1.8 LTR 16 VALVE 1995>>. THIS SET DOES NOT FIT VVCi ENGINES. The item "ROVER K SERIES 1.4 1.6 1.8 MLS HEAD GASKET SET+HEAD BOLTS+CAMBELT KIT+WATER PUMP" is in sale since Tuesday, January 9, 2018. This item is in the category "Vehicle Parts & Accessories\Car Parts\Engines & Engine Parts\Gaskets & Seals". The seller is "midlandcomponents" and is located in Walsall. This item can be shipped worldwide.